Where should a fan be aimed for maximum cooling of a room with one opening? In a hot, closed room with just one opening (say, the door), where should a moveable fan be aimed for maximum cooling of the room. What is the science behind it? For example since hot air rises...if the fan is on the floor it should be aimed towards you? And a higher elevated fan aimed outside the door to blow the hot air out? This depends on your environment. If the temperature is cooler outside the room blow the air into the room with the fan either in the doorway or just outside it to get the cooler air into the room. If the room is cooler than outside close the door. If they are the same temperature it won't matter. I've found that blowing cooler air up and at angles to the walls helps keep the whole room cooler since it circulates throughout the room and helps keep the hot air at the ceiling from getting really hot. Since there is only a single opening, air would have to flow both in and out of the same passage. To direct the coldest air into the room, place the fan at bottom. Don't disturb the air flow of the fan - especially at it's back. The air will be soaked in. Hot air rises. 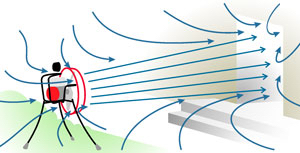 To push hot air out of a room, it may help to place the fan on an elevated level. Outside of the room may be outdoors. The arrangement of air layers is not always like in a closed room. Then an airflow aimed inwards may produce different results. This diminishes the general usefullness of this direction. To answer the question: Just maximize the air flow, by not blocking it. The direction will not influence the volume of exchanged air. However try to blow the warm air at the top of the room out. Most benefitial for cooling is evaporation. This physics effect is based on needed energy to overcome "latent heat". Just remeber the chill when rising out of a lake after swimming at windy weather. The water droplets on your skin have the temperature of the sea. Then they evaporate and cool your skin. A bowl of water before the fan will not help much. However just wetten your skin - maybe use a wet towel or blanket during sleep. The fan should be well outside the door, facing towards the door. Imagine if you could see the air coming out of the fan, that it's bright green. It gets wider and spreads out as you get further from the fan. You want the fan far enough away that the entire door is taking up by the bright green air. Searching for how firefighters ventilate a room will give some good pictures . What is the best way to cool off with an oscillating fan without having it blowing directly on me? How to heat your room efficiently? How to have cross ventilation in a single window room? How to cool an object coated in a thermosetting substance, without damaging/leaving an impression in the coating?